Ok, so Cardiff isn't exactly on the doorstep. But if you're going to do a half marathon four weeks before the Virgin London Marathon, you might as well do the World Half Marathon Championships. 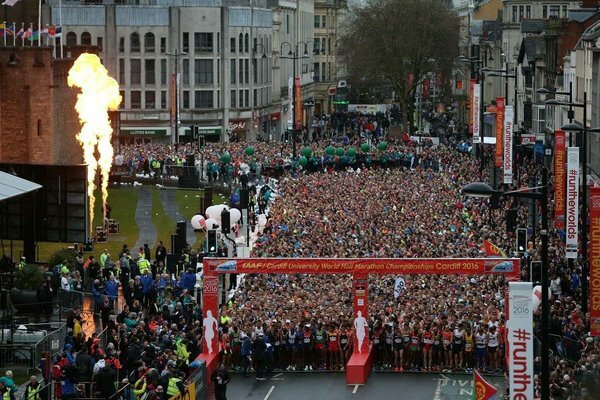 I'd had no taper for this race, and the weather forecast wasn't good, but I still had a feeling I could run well in Cardiff; and that proved to be the case. It's always a good idea to mentally prepare for three outcomes, perfect, good and satisfactory. The most important outcome of the day was an injury free run with the training benefit of 13.2 hard miles - not to lose sight of the fact that it was a training session for London; albeit the most high profile race I'd ever been a part of. I managed three sub 18 minute 5k's to get me to 15km (just under 10 miles) at a pace that would have got me tantalisingly close to my 'perfect race' time of 01:15. Unfortunately, that is when I started to slow - possibly due to fatigue, or some minor 'stomach issues' but most likely due to the monsoon that engulfed Cardiff for the last quarter of the race. I have honestly left the bath drier than I left Cardiff that day. I really had to dig in as others around me were starting to slow up a little too. I managed to get into a little group to work through the last few miles, courageously led by the female winner of the 2015 Greater Manchester Marathon, Georgie Bruinvels - who I later went on to pass. So, a PB of 01:16:03, and a fantastic weekend. I still have unfinished business at this distance, but that can wait until later in the year. Finally, a mention to my partner in crime Michael Littlewood who ran a very strong time of 80 minutes on fatigued legs - all looking good for London. So having ran a few half marathons I, like many, thought that the next natural progression would be to go for the full marathon distance, but not just any old marathon, no no, I decided that it would be a good idea to do half of it at night & I chose Kielder, renowned for being flat! Not! 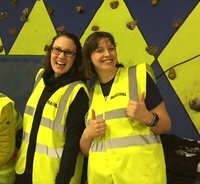 I was very impressed by Trail Outlaws when I marshalled for them at my local Washington trail race so I asked if I could have a place in their Dark Skies run in return & they confirmed there were spaces - just like that I was in! Eeeek! I then learnt it wasn't just a marathon - it was at least 26.5 miles! Double Eeek! I invested in some 'long run' kit & started upping the mileage - usually incorporating a coffee shop refuel half way! 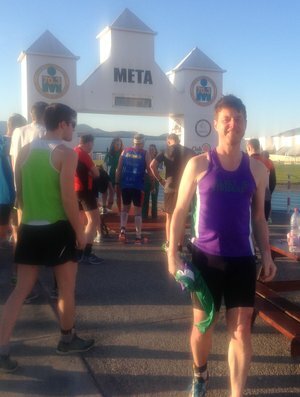 As part of my pre race prep it seemed I managed to 'encourage' other purplies to either run it (some of them marathon Virgins like me) or marshal it so we could make an adventure out of the whole experience. One of them being Gareth, a fast lad who had never been on his feet longer than 3hrs! Not sure who had the biggest challenge ahead - what I do know is I would never have entered or completed this race without becoming part of the purple family! Finally the big day arrived as did storm Katie! The forecast was for rain, rain and more rain, plus some wind! Great! Not only would we be unlikely to see any Dark Skies or Northern lights we were also probably going to be rained on heavily for most of the race! I felt bad for all those people I had roped into the crazy plan in one guise or another! We arrived at the scout hut/HQ and got our numbers, passing the kit check easily, mine weighed 6lbs! I can assure you I had what we needed and then some! We saw our purple support crew in action and welcomed the other purple posse runners as they arrived, the weather wasn't too bad at this point and we were all hopeful it might not be as predicted, until about 4.30pm, 30 mins before the start of the race when the heavens opened and pretty much didn't stop until about 10.30pm! At around 5ish we were off! Wishing everyone good luck Gareth & I settled into our pace and the miles were ticking off nicely, despite the awful conditions I was enjoying the views & seeing the marshals and other runners along the way. Soon enough we were at the first checkpoint and it was lovely to see our purple support crew, they seemed a little surprised to see me / us so early, I took that as a compliment and with a spring in my step off we went again! Soon it was dark enough to need our head torches - it was fab seeing all the lights moving through the trees and up and down the MANY hills! We kept hydrated & filled up on the various (some soggy) treats at each of the checkpoints and all things considered we were doing great, on pace, running all the way (even up THOSE hills) and we even got to see some stars!! Wahooo! I practically fell into Kerry and Denise when we saw them, Flip was on a rescue mission and didn't even recognise us as we passed him! Kerry said 'you are doing great, only 2.5 miles to go' I think I practically screamed back at her '1.5, surely?!?! Please!' We were on 25+ miles by then - I showed her on my watch! She said 'oooops! Yes 1.5 then I've been telling everyone 2.5!' I was so relieved after my early distance confusion I couldn't face another! After hugs all round and being pointed in the right direction for 'home' by ET Archer (aka Matthew) we set off on the last 1.5 miles, I felt emotional by this point, I knew then I was going to finish a tough first marathon in horrid conditions & I was suddenly a bit overwhelmed. I had done it! I was over the moon! 22nd lady and 14th in my age category! I was also so so proud of Mr P who helped me round and had achieved the longest time on his feet ever!!!! 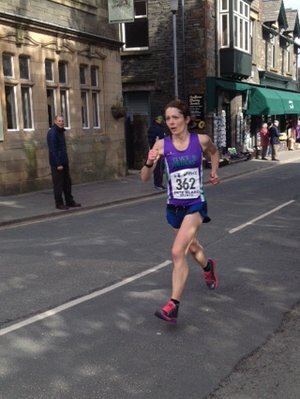 Anita Clementson was in ahead of us with a new marathon PB and soon after us was Jane Ives. 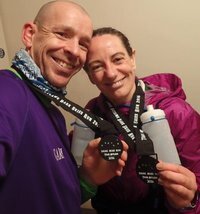 Jury is still out as to whether I will run another marathon or more distance wise but I would like to thank all those involved in making it an awesome first marathon (ultra) experience and I would highly recommend Trail Outlaws races to anyone fancying a new / different challenge - either to Marshal or Race or both! ﻿Saturday's final NEHL x/c race of 2015-16 saw Striders men's team finish as Division 2 champions, after securing first place on the day, thereby achieving promotion to Division 1 for the first time in over twenty years! The Women's team, already in their Division 1, also achieved their highest placing for the season of 4th on the day and 6th for the season as a whole - a solid performance that bodes well for next year. Well done to you all! 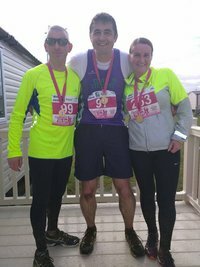 Over 120 Striders took part in HL this year and each one of them has contributed to the club's success. They've done this not just by running their hearts out for Striders, but by creating a wonderfully friendly and inclusive atmosphere around the Striders' banner whereby everyone feels part of the team, is happy to give their all when competing over what can be challenging terrain and want to come back for more. 'They also serve who stand and cheer' and this year we've had some marvellous vocal support from Striders and their families out on the course. On occasions the volume of support has been almost overwhelming although absolutely invaluable to those running in finding that extra yard of pace and determination to finish well. So thanks again to one and all, I know I haven't been alone this season in feeling an enormous sense of pride in Striders and for what it stands. And so to Saturday's race. The weather was fairly benign - cloudy and cool, but with little wind and no rain, and a dry fortnight had left the undulating course in a fast and runable condition. The Senior Women were first up and a returning Helen Tones was soon near the front of the field pursued quietly by Juliet with Mandy and Steph P not far behind. And that's how it finished as for once our medium and fast packers were unable to overhaul their slow pack club mates on the slightly shorter than normal course. Nonetheless Penny and Louise proved to be the fastest Striders on the day while Laura J ran well showing no ill effects from a very cold day at Alnwick. Jill Rudkin made her debut and displayed a very determined dash for the line and she was supported by a host of Striderettes enjoying the pleasant conditions underfoot. Among these were fellow debutant Rebecca Talbot, x/c enthusiast Catherine S, the evergreen and exuberant Jan, the regal Victoria and the bright but determined Jo R. Well done to all who ran - next season awaits with opportunities to do even better! The rallying cry that had gone up around Striders in the preceding week was answered with gusto by no fewer than 32 senior men - one of the largest, and certainly our strongest, team in my seven seasons as x/c captain. The pre-race atmosphere was tense but optimistic as we gathered for a group photo. We knew if we finished in the top three teams we'd be promoted but, if we finished first on the day then we'd be champions - bring it on! I felt a twinge of pride at the start as I looked around at war painted Striders both new to the club such as Jason, Andrews G&H, & Daniel and 'old-timers' like Keith, Mike B & Shaun the Sheep. I knew they were as determined as I was for Striders to get their 'just reward'. Part way round the first of the three laps I allowed myself the luxury of glancing up at the front of the field where I saw two purple vests among the first ten or so runners. These vests belonged to Andrew Hopkins (making his HL debut) and Jason Harding (in his second HL race) and they maintained that position until the end finishing in 6th and 8th place overall respectively - fantastic and exactly what we needed! They were soon followed in by x/c convert Gareth having probably his best ever run in mud and qualifying for the fast pack next season! Michael M was next with a magnificent run just missing out on fast pack qual. 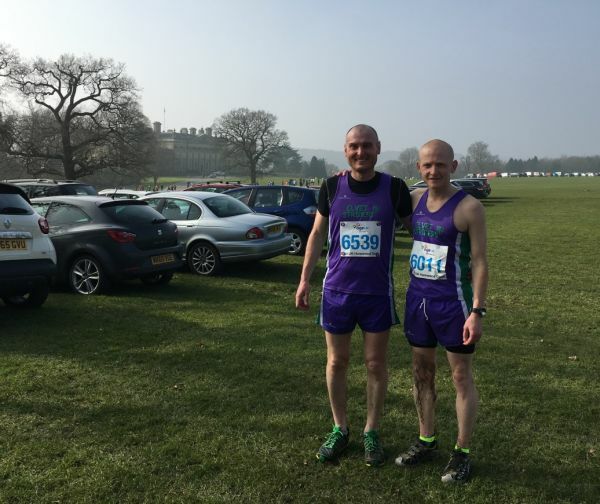 Then came another Michael (Littlewood) and fastest Strider on the day Stephen both of whom had chosen, unselfishly, to run for their club on Saturday and their contributions proved to be invaluable. As ever, our counters were supported by a host of Striders each fighting to finish ahead of as many of our rivals as they could possibly catch - and how they succeeded! Brave debuts came from Daniel and Richard G while there were fighting come backs from Danny and David G. There were battle royals between Striders such as that between Matt, Tom and James and magnificent medium pack surges from Mark & Jack. But I know everyone who ran tried their hearts out from the youngest to the oldest and the fastest to the slowest. I can't tell you how proud I am of every single one of you. You are all part of this success and you all thoroughly deserve it - well done! The dark days of failing to field a full team and of relegation to Division 3 are now well behind us, we can look forward to competing in the 'sunny uplands' of Division 1 next season! I hope you've managed to read this far because I'd also like to mention all those who came along to support on Saturday. The cheering from our purple clad spectators was very loud and inspiring not just from male / female clubmates who had, or who were about to run, but in particular from those who'd come along just to watch such as Chairman Paul, The Sage of Shincliffe (Allan S), Kate, Stan (taking photos), Conrad, Fiona K-J, Katy, Joan, Teresa & many Strider children - thanks to you all, your contributions were just as important as those who ran. 'Cause I believe in Striders. 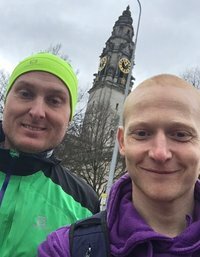 Peter Hart asked Mark Todman and me if we would like to run this one with him as he is currently in serious training for the Edinburgh Marathon. Fast forward a couple of months during which the training I had planned in my head to be ready for this distance did not really come to fruition, there we were the night before the race and I think both Mark and I were feeling a little nervous about it. Mark's wife looked at our faces and pointed out "you know, you don't HAVE to do it" and I must admit I was slightly tempted not to. "But, I've paid for it!" I said. Ultimately, I was glad that I did do it. The weather was just right for running, for me at least, cloudy and cool with little wind. There was a great atmosphere in the village and we even had some unexpected cheery encouragement from a couple of Blackhill Bounders who passed us during the first couple of miles. Pete took off after about a minute and Mark got a bit ahead of me as I was worried I was going out too fast but then I realised we were doing the same speed more or less so caught up with him and we ran the rest of the race together. I know the road to Torver fairly well by car and had been worried about how the 'undulations' would take their toll. However, I seem to have improved a lot on hills in the last six months and at the six-mile marker all felt good. There were plenty of water stations which were a welcome chance for a bit of recuperation and also broke up the distance a bit. We had planned to walk the mythical 'mega hill' we had spotted on the course profile between miles 11/12 but we ended up doing a bit of walking on some of the others as well during the second half in order to not be completely KOd before the end of the race. 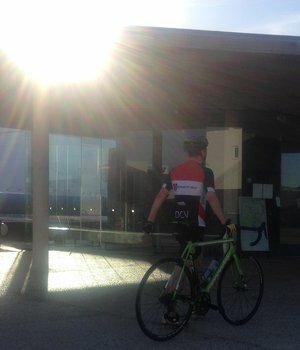 Some excellent support en-route, especially from cyclists, both those passing us, and the group parked up doing a loud and hilarious 'mexican wave' on the far side of the Lake. 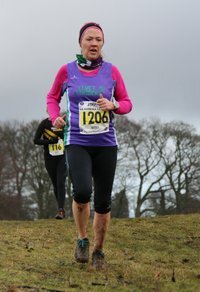 Serious kudos must go to Elaine Bisson on her excellent performance as 7th lady with a time of 1.37 and great runs from the other six Striders as well. 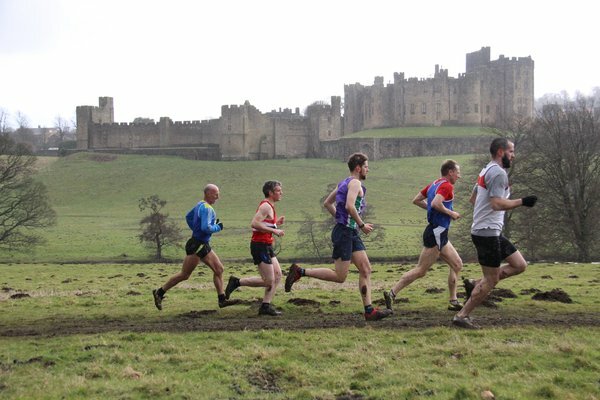 A well-organised enjoyable race that I would thoroughly recommend. If I'd been nervous for the Half Marathon the nerves were nothing compared to those I felt for the Triathlon. Or 'MiniTriathlon', as it was billed. I kept telling myself a mini triathlon was just a bit of fun, and the man who'd sold it to me (zero Euros again) insisted it was 'beginner friendly'. I've always wanted to give a triathlon a go but never had the courage. Even though I know they're friendly, informal, and not at all scary, that doesn't stop them being scary. They remind me, strangely, of orienteering competitions. I know, as someone who has done a lot of orienteering competitions, that they are fun and friendly and suitable for all abilities. But to the first timer they can be daunting beasts and I always have sympathy for people who see them as a bit intimidating. So there we were, at 730AM (on holiday), for the second day in a row, waiting for the briefing. Roberta had got up (again) to see me off, not that she got much sleep with me pacing about. Our villa overlooked the swimming pools which, on the one hand, were pretty impressive. On the other hand, if ever I glanced out of the window during the night, there they were, in all their floodlit glory, taunting me with their massiveness. The briefing was pretty straightforward. No cycling in the complex. No running over the timing mats in cycling shoes. But the main thing was to "Make sure the Timing Mat says BEEEEP!" - good advice. We started in the pool, picking lanes according to our ability. I picked a slow lane and was just beginning to know my lane-mates well before it was time to start. Off we went and I settled into a steady breaststroke. I'm rubbish at the crawl but after a few lengths I was discovering that my breaststroke was a lot faster than some of my lane-mates' crawl. Not that it mattered. Overtaking was never going to happen, not without implementing some sort of congestion charge. Anyway, the sun was out, and I zoned out, knowing that the swim wasn't a big part of the event and I wasn't going to make any real gains here anyway. Out of the pool and an exciting jog around the poolside before crossing the timing map, making sure it said BEEP! and onto the bike. It may have only been 0830 but there was never any danger of being chilly. The bike section was a long, steady climb up to the neighbouring village of Tinajo, round the roundabout, and a fun descent back to Club La Santa. I'd passed a few people on the bike section and now I fully expected them to be popping by again on the final run section. 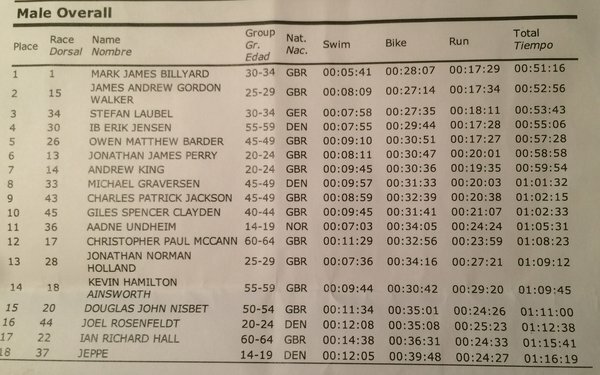 I knew I'd be ok on the bike section, terrible on the swim, and indeterminate on the run. The last section was a bit like a handicap - all the time expecting to be pipped on the final approach. It was also a good motivitor and encouraged me to push hard on the final few km of the run. A final push round the track to the finish then across the timing mat, which said BEEP!, and relax. I looked at my watch and it wasn't even 10AM, and I'd done a triathlon! Time for breakfast. 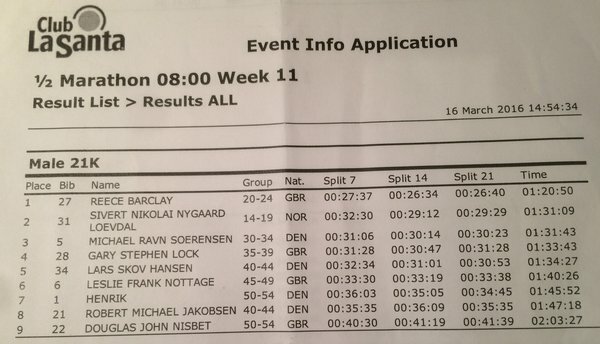 There's something exciting and compelling about competing abroad and I've read and published with varying degrees of envy many race reports from Striders on their travels around the globe. It's something I've always wanted to do but never done. Our holiday to Club Lasanta was a bit of an impulse but fellow Strider and physio Neil had recommended it so we reckoned it was worth exploring. It was either that or more lunges. Day one was pretty much wandering around being pleasantly bewildered before I got my head round things. The weekly programme said there was a half-marathon the following morning at quarter to eight. That seemed a bit early. Did I dare give it a go? And, more to the point, and interestingly, why was I so apprehensive? It's not like I've not done a shedload of half-marathons so I was curious about why this particular one should be making me so nervous. I gave myself a bit of talking to and signed up. At a total cost of zero Euros it was about the same price as a parkrun. I turned up the next morning 10 minutes before the start as requested and was surprised at how jittery I was. George says he's always nervous before the GNR whereas my usual pre-GNR emotion is abject boredom, so why was I so nervous as I stood in the early morning sunshine, on holiday, with about a dozen or so other runners waiting for the briefing? Funny thing nerves, they all hit us differently. 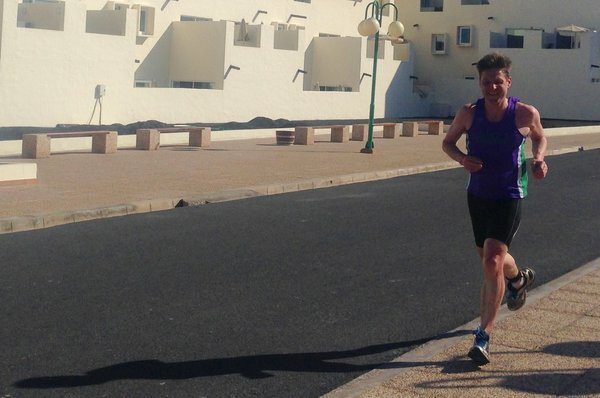 The half-marathon route is the same one used in the Club La Santa Lanzarote 70.3 IRONMAN and comprises 3 7km loops each including a bit round the running track. This adds the flexibility of allowing runners to opt for 1, 2 or 3 loops depending on how they feel and how far they want to run. Sounds fine but I have to say that quite frankly I found it a bit weird. I intended doing the full half but others that I was following clearly didn't. What interested me was how disconcerting I found it to be when the runner a few hundred yards in front of me, who I thought I might pull back by the finish, just suddenly wasn't there any more. Because they'd dropped out at the end of the current loop. There's a strange subtlety of racing with and chasing runners not knowing whether in their head they're racing 7, 14, or 21 km. I haven't thought of this before because I've not raced in this situation before, and now that I was, I was finding it well weird. Just over 2 hours from someone shouting 3-2-1-GO! I crossed the finishing mat and thought that I hadn't done too badly for someone who hadn't done a half-marathon for a while, wasn't used to this temperature at 9AM, and hadn't had their breakfast yet. But I was still comfortably in last place. Still, looking at the results, I see I was first Strider home, so I'm pretty happy with that. I entered the Liverpool Half Marathon shortly after the Brass Monkey, finishing 99 seconds away from the "dream time" (sub 90) I had cajoled myself into thinking that I could do it. I sold it to my husband as a fun trip back to Liverpool (we met there nearly 20 years ago), oh and there just happens to be a race that weekend too! I set myself a plan and a few runs at target pace had me believing I could actually do it. As the race starts at 9am Sunday we travelled down on Saturday and had a good wander round all our old haunts, by 7pm I was ready for bed and wondering if the day on my feet would scupper my plans. Race day, we arrive for 8am, park within a few minutes walk of the start. The race starts and finishes on Canada Boulevard in front of the Port of Liverpool Building. Race HQ were just near this area, there was a stall serving drinks and masses of portable toilets. The hazy sun was gradually burning through the clouds promising a glorious day ahead, there was not even a hint of a breeze, perfect conditions for a PB. As my nerves started getting the better of me, my husband told me straight "today you will do this, now make it happen" (easy for him to say). There are 7000 runners, split between the HM and 10m race, all starting at the same time, the 10m route misses off the loops of Sefton Park. Having read reviews, I knew I needed to get into the start pen early, I "gracefully" jumped over the barrier and plonked myself right next to the 1.30 pacers...4 very fit men. Sophie, my loudest cheerleader, leant over the barrier and commented "mummy I don't think you'll keep up with these men"... nice to have good support!! Finally the 10 seconds were counted down and we were off. The course is generally flat. Passing Albert Dock there is a gradual incline and then a sharp incline of 400m at Upper Parliament Street. Other than that, it undulates around and through Sefton Park. By this stage I had caught up some of the 10 milers which threw me...initially I thought a woman in her 70s had perhaps just gone off too fast?! There are some slight and much welcome downhills along Devonshire Road and Aigburth Drive. There is a tight bend as you run down through the underpass and then come out the other side. By this point, around mile 8, I was still firmly stuck in the 1:30 pacer pack, they were slightly ahead of target pace. We then move immediately into more covered parkland through Otterspool Park, there is a final climb up to the promenade and the pacer tells us to "keep it steady up the hill then we'll pick up pace"....really?! The final four miles are flat following the Otterspool promenade along the waterfront to the finish line. I think this will be a welcome sight but it feels relentless, the 1.30 pacers having picked up pace, are gradually pulling away from me. I keep putting in efforts and keep their orange tops in sight but I feel like the dream is slipping out of reach. By mile 11 a quick calculation gives me a boost...I could still do this. I start to pass a lot of flagging runners. The docksides are lined now, I realise how close I am. I pass the Liverpool museum, the drum band and masses of spectators spur me on, the finish is in sight, the clock is in sight, 100m to go, the clock is ticking 1:29:42, 1:29:43...realisation dawns that I could do this now or within seconds mess it up entirely. With all my might I will my legs to move faster, the man calls out my name and I cross the line... I stop my watch and the glorious numbers pause on the screen 1:29:46....John and my three kids rush to meet me unsure that I pulled it off (the pacers being ahead of me was not a good sign) but from the manic grin on my face and my inability to not jump up and down, they know I've done it. A gym 5 minutes walk away offered free access with prior login for runners, we head straight over and I dive into the lovely warm showers. We then drive over to Southport for tea, fish and chips, and to continue our reminiscing and celebrations! It is, of course, so much easier racing in your head. In my head I was stronger than the young runner who 'out kicked' me with 200m to go and denied me a place on the podium. The reality was that this was a really good day for my London marathon training, a 90 second improvement on last year and a good time, a whisker over 36 minutes, on a really challenging 'undulating' [read hilly] course. A couple of years ago a friend of mine recommended I run the Dentdale race - "just your kind of thing" she said, so it was one that had been on my radar for a while. When I discovered I had a Saturday where I wasn't needed for ferrying to children's parties I elected to give it a go. It was a bit of a last minute decision and I had no thoughts on pace or race strategy - I decided I just wanted to enjoy it. When I got to the pretty village of Dent I was happy to see a good number of Striders, discussing how many layers we needed and warning each other of the hills ahead. The race started at 1pm which caused me all sorts of quandaries with regards to eating. As we lined up to start I realised my stomach was already rumbling and asking for lunch but it was too late to do much about it. Whilst waiting for the gun I spotted a Swaledale runner who I knew was pretty speedy and has beaten me on a number of occasions but I'd just manage to squeeze past her at the Viking Chase last year so knew she was a good target for me. I decided to try and stick with her as far as I could. The race starts with a deceptively speedy descent but before long the first of many climbs kicks in. I managed to tuck in behind my Swaledale friend and began to enjoy making my way through the beautiful countryside. The course is a kind of figure of 8 (without crossing at the centre) so at the half way mark I caught sight of my car in Dent. Much as I was enjoying the race I was beginning to tire and was aware of more hills approaching but I resisted the temptation to just jump in and drive home. Around this point my Swaledale friend slowed down to have a gel. I pulled up next to her and we chatted about other races we've done and plans for the future. After a couple of minutes she waved me on, saying she felt she'd started too fast. Not long before, one of the many fabulous local supporters had told us we were second and third ladies and I began to worry I too had gone off too fast. The second half includes one very long climb and then you get lulled into a false sense of security as you approach the half marathon point with a nice descent. The 13 mile marker hails a killer little hill and the last mile seemed to go on for ever. Eventually we were back in the village and the crowds were fantastic shouting us in so I managed a bit of a sprint finish (ish). I was delighted to see Gareth and Jack who had both had great runs and after a bit of refreshment we cheered in the other Striders. All in all an absolutely beautiful, runnable yet challenging race and definitely one I'd recommend. My friend was right it was definitely my sort of thing and I hope to be back! The Senior Women were first up and looking to improve on their 8th place in the league for the season thus far. Seventeen Strider women formed part of the 278 strong field. 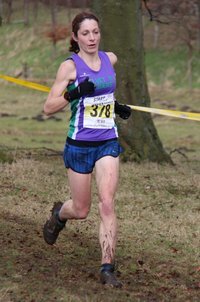 Juliet Percival was first to show for Striders from the slow pack, fresh from her Ultra running insanity, and closely followed by Steph P, a recent 'x/c tourist4' at both the Northern and National championships. Debutant Laura J wasn't far behind them either, although the muddy conditions and cold temperatures were to take their toll on her. But Saturday saw some blistering performances from our medium and fast pack runners. 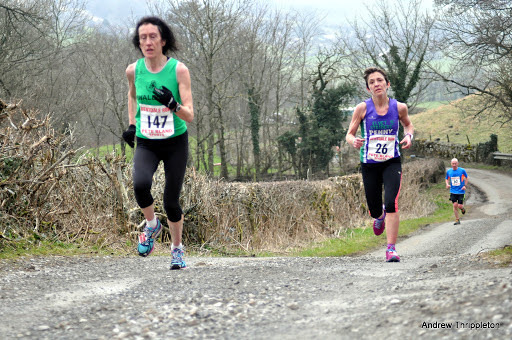 Elaine Bisson in particular put in a fantastic performance to finish in 17th place, first Strider home and gaining promotion to the fast pack for the first time. A wonderful example of what can be achieved with determination and application - well done Elaine! Club vice-captain Penny was second Strider home running from the fast pack and showing her usual blistering pace and pride in the purple vest. Juliet's hard won fitness was rewarded with third counter position and Tamsin completed the counters with perhaps her best ever x/c performance zooming round from the medium pack. As ever our counters were backed up by some resolute running from the Striderettes including Louise W and Mudwoman from the medium pack, Fiona W on her long awaited HL debut, Jan Y first in her age group, Rebecca D & Caitlin both with wonderful sprint finishes, a welcome return from Stef and valuable performances from everybody else. Well done and many thanks to you all - you've helped your club jump two places in the league (6th for the season, 5th on the day) and we've now every chance of a top half finish for the season. 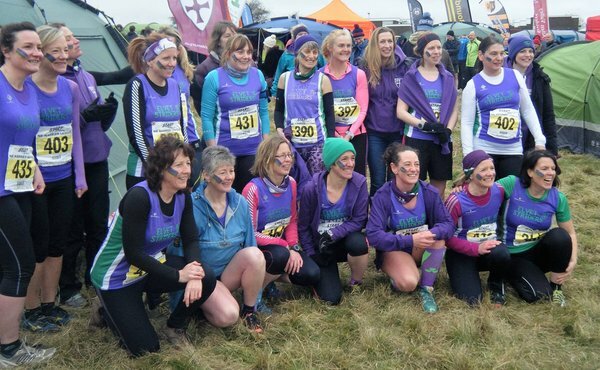 And who knows, next season our women could be adding to the three Harrier League Championship wins that the club already holds - something a club with 400 members can realistically aspire to! Unless you've had your head buried in sand for the past few months you'll know that Striders men's team are in with a real chance of promotion to Division 1 this season. The determination to help achieve that goal was almost tangible in the tent on Saturday. From debutants Jason and Chris, through to old hands like Mike B and Conrad, the desire to perform well for the club was universal - and what a performance it was! 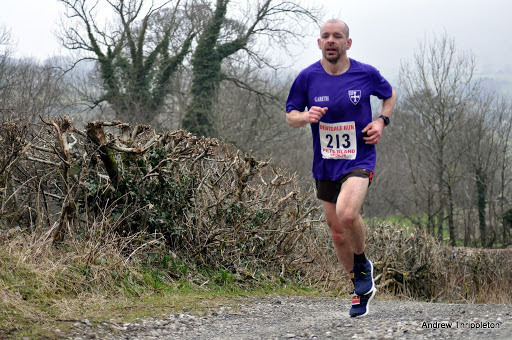 Jack Lee, fresh from a run over the snowy Lakeland fells, skated round the now muddy course, through the hail showers to finish in 24th place (in a field of 426), first Strider home and achieve his season's goal of promotion to the medium pack. Well done Jack - a great personal achievement and a real Striders success story. Jack was followed in by an unsung hero of Striders, Jerry Lloyd, a man who achieves success quietly and without fanfare. Promotion to the medium pack again for Jerry - well done! The other counters were made up of Jason H, with a fantastic HL debut run, Michael Mason with a typically powerful run from the medium pack, likewise Gareth Pritchard straight off a night shift and Stephen J running from the fast pack and achieving the fastest time for a Strider - fantastic! The other twenty Strider men also served to fly the purple flag and come between runners from other clubs and higher finishing positions - a vital role in our success story. Michael L and Mark were running from the medium pack for the first time and both put in blistering performances, Paul Swinburne had his best HL run so far, Tom continues to improve, Richard H made a welcome return and Phil T was cocker hoop with his gutsy run. There's so many more I could mention such as Alex C, Malcolm, Aaron, Captain Ayres, Mike x 2 and everyone else. They all dug deep for their club and their team. Times & PBs are of no consequence here, it's where you finish that counts and whether you finished in front of as many runners from other clubs as you possibly could - and that's what they all did, every single one of them and that's why we finished first club in Division 2 on the day leaving us in second place for the season, just one point behind the leaders! So, we're on the brink of promotion to Division 1, somewhere we haven't been for more than twenty years. The spirit in the team is as high as I can remember but we haven't achieved it yet. We need one last effort at Wrekenton from as many Strider men as possible, whether they be seasoned x/c runners or novices, the club needs you all if we are to clear that final hurdle! The hail started as we drove up Sutton Bank and I knew we were in for a dramatic day. We were on our way to Flamingo Land. I'd dragged the family out of bed at 6:30am to get there for 9:30am. They were not happy. The zoo was open but none of the major rides would be (until the next week). I was heading for the second, and my first, running of FlaminGo 10k. In aid of the Udzungwa Forest Project, apparently. Yes, it's a real place. In Tanzania. This race wouldn't have appeared on my radar but we were on our way to meet our friends, Sarah and Jamie, who own a caravan in the park and suggested I enter. I'm glad they did. They're both quite fit, Sarah is a swimmer and Jamie loves cycling. He's a pretty fast parkrunner and might have the edge on me over 10k. The race was 2 identical laps that snaked through the park and camp site and around the outside of a ridiculously muddy golf course. There was a couple of small rises but other than that it was flat. It was the most twisty 10k I've ever run and the muddy golf course slowed everyone down. Not as badly as you guys doing Alnwick XC I imagine. 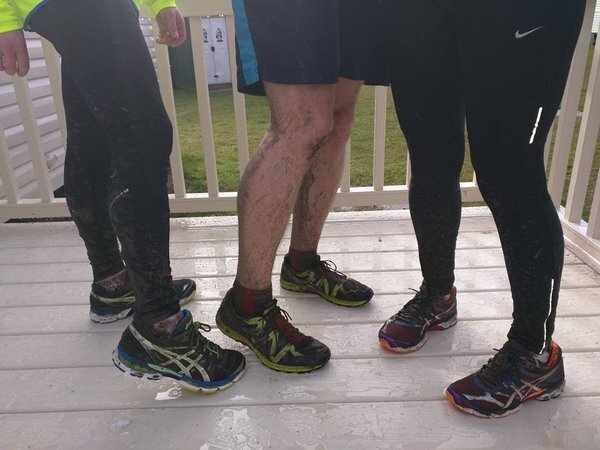 Runners were allowed free entry to the park but they were generally too wet and muddy to really make the most of it. Luckily we cleaned up in Sarah's caravan and had the afternoon in the park. The rhinos and giraffes were impressive but there was only a couple of small rides open for the kids. It was a fun 10k with novel scenery. I'll probably do it again next year but might not drag the family along. Maybe I could drag some other Striders?